Regarding adjustments to life in Spain, one of the first things tourists will notice and expats will warn you about is the difference in eating schedule from the US: here, lunch is around 2:00 or 3:00 pm (or for me, sometimes closer to 4:00 pm) and dinner hovers between 9:00 and 10:00 pm (and can be pushed even later on the weekends). With a careful rationing of snacks, adjusting is not too difficult. I got accustomed pretty quickly when I lived in Sevilla, and even faster here in Madrid on my second Spanish tour. But I never really stopped to ask myself why Spain and the US differed so much on this topic; I simply chalked it up to cultural difference. It turns out that there’s a very logical explanation stemming from a concrete moment in history. Prior to dictator Francisco Franco, Spain was in its rightful time zone, Western European Time aka Greenwich Mean Time, along with its peninsular neighbor to the west, Portugal, as well as the United Kingdom, which is located northeast of Spain. Makes sense that España, sitting between these two countries, would share their clock. However, in 1942, Franco, in an attempt to be more like his German and Italian idols/allies, joined their time zone (Central European Time), pushing Spain one hour later than its global position dictates. In the post-Franco era, during which the country tried to distance itself from all things Fascist, efforts to shift Spain back to its rightful time zone have been unsuccessful, and it remains out of whack to this day. So, when Spaniards eat lunch at 2:00 pm and dinner at 9:00 pm, they’re simply following what the sun’s placement in the sky is telling their bodies to do – lunch is around what “feels like” 1:00 pm, when the sun is high in the sky, and dinner is at the internal hour of 8:00 pm, when this sun is somewhere in the process of setting, depending on the time of year. These eating hours, while perhaps a bit late for most Americans, are more understandable for my compatriots and more in step with other Mediterranean countries like Italy and France. Para mis amigos bilingües, aquí tenéis un artículo interesante sobre la historia de Franco y el cambio de horario español. Here you can see a series of photos taken from my balcony at 9:15, 9:30, 9:55, 10:05, and 10:15 on a clear night last week. It was only in the last one that the flash on my iPhone was activated. Any good educator will tell you that teaching is a two-way street – we impart knowledge upon our students, and we also learn a great deal from them. Of course, this is true. Depending on the age level and subject matter that one teaches, this student-to-teacher flow of learning may provide the teacher with ways to improve his or her pedagogy, inspiration to persevere in the face of adversity, concrete subject-matter facts, or a change of perspective that can only come from seeing the world through the eyes of a child. While I certainly have had this experience while working with my kids at IES Leonardo da Vinci, bidirectional knowledge exchange is even more obvious in the conversation classes I teach. In addition to my regular classes at school, I hold a weekly conversation group for my coworkers, have four private classes outside of school, and I also teach twice weekly at an English conversation group at a bar, where students come for an hour and a half, are organized into small groups by level (no more than three students and one teacher), and chat in English over drinks and tapas. In the latter, we always have a list of five topics, often ripped from the headlines, to spark conversation among hesitant students, but we usually end up meandering across a wide variety of subjects, most of which are not on the list. In fact, I judge a successful session by how little I rely on the cheat sheet, since the goal of the sessions is to recreate, as authentically as possible, a casual social meet-up of friends at a bar in an English-speaking environment. My job, of course, is to guide the conversation, ensure equal student participation, and correct grammatical errors while offering new words and phrases to enhance students’ vocabulary, both during and at the end of each session. 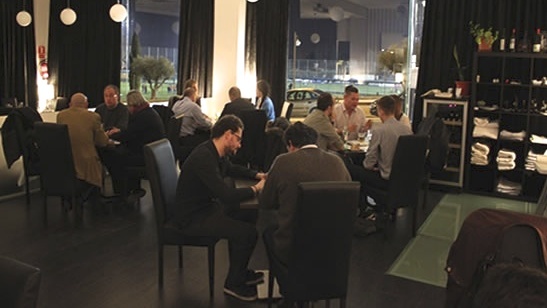 English conversation groups at Chapoo Restaurant and Bar in Majadahonda, Spain. You can find me in the back corner wearing a blue sweater. In both my private classes and the conversation groups, the truth of the matter is that I more or less get paid to speak in my native language. Easy peasy. Yes, I have to prepare material, and I must focus carefully on students’ use of English and delicately maneuver in-conversation correction without disrupting conversation flow or discouraging participation. But beyond that, I’m paid to talk. I can think of many a friend and family member back home who would do really well with this job description (ahem…you know who you are…). Being someone who is shy in new situations and quite chatty once comfortable, this has been an excellent crash course in being talkative from the start and managing a wide variety of personalities in a group setting. But what does this all have to do with the idea of education being a two-way street? Well, while I coach my students in pronunciation, colloquial phrases, prepositions and false friends, they tell me about their lives. Their rich, varied lives. Save one high schooler, all of my students are 4-40+ years older than I am, and they each have a unique set of experiences and advice to impart upon me as they practice their English. In my private classes, I have a student who is a camera operator on movie, TV and commercial sets as well as an avid mountain climber. His girlfriend, also my student, studied forestry and spent time living in Finland. I also teach a high school junior who knows more about European history than the Encyclopedia Britannica. Once, I tutored my landlady’s Italian daughter-in-law who is studying a Master’s in English literature, and had to brush up on my iambic pentameter (something I never quite mastered in 12th grade AP English and certainly didn’t master the second time around while preparing for this tutoring session) before an exam. Among my coworkers who participate in my conversation class at school, there are psychologists, avid travelers, economists, mathematicians, biologists and ingenious engineers, all of whom are also passionate and dedicated educators. And this is just the tip of the iceberg. In the conversation groups at the bar, I’ve had the honor of teaching dozens of Spaniards from all over the country, as well as people from Argentina, Switzerland, Cuba and Ukraine. One gentleman is looking to improve his English to get a job in Qatar to be closer to his wife who is working in Kuwait. Another woman joins us because she has extra free time in retirement and wants to keep up her English while studying French on her own and Italian at a language school. We have doctors, nurses, statisticians, pilots, businessmen, housewives, jewelry makers, journalists, chemists, architects, engineers and musicians, all of whom end up, through the course of a 1.5 hour session, teaching us a little something about their profession (and often philosophizing a bit about life while they’re at it). I have even learned about the world of corporate gifts (i.e. the pens you end up stealing from hotels and the calendars that real estate agents send you in the mail) – not a fascinating topic on paper, but the ins and outs of the field were actually quite interesting. Just this week, a young woman told us about her favorite hobby: scuba diving. And of course, we have lots of students who are also teachers, of both primary and secondary school, who share funny student anecdotes and useful tricks of the trade. To top it all off, I have received countless travel recommendations, as well as names of books, bands, films, restaurants and websites that I need to check out. And all of this over a glass or two of wine and some mussels or patatas bravas. Not bad at all. We’re currently in the midst of a good old-fashioned puente. 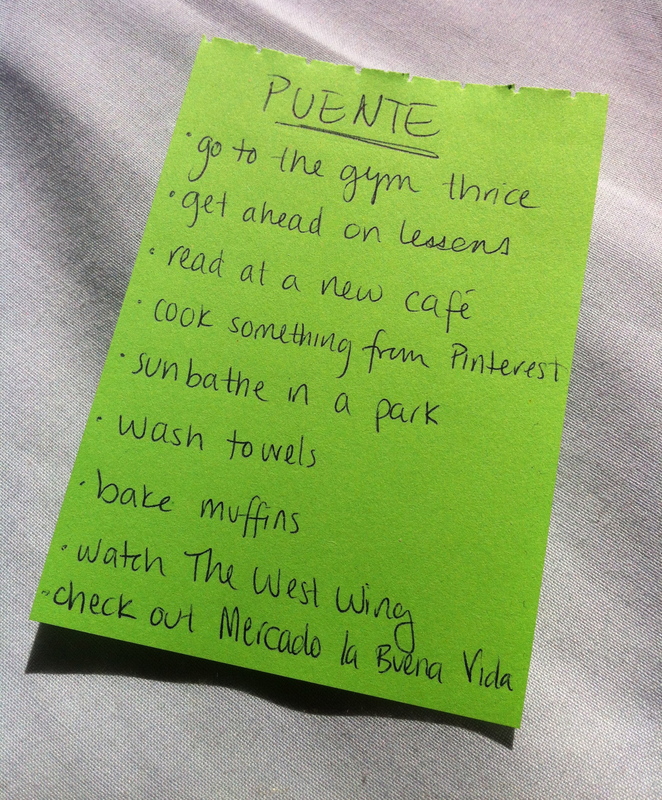 Puente, meaning ‘bridge,’ as I may have mentioned before, is the wonderful Spanish tradition of creating a mini-vacation when a holiday falls in the middle of the week. Wednesday was Labor Day, bittersweet this year after the announcement that unemployment increased yet again to a record high 27% and that the crisis will probably continue for two to three more years before improvement is seen. Thursday was a holiday in the Community of Madrid, remembering an uprising against the French in 1808. And Friday? Well, in comes the puente. While I’ve jumped on past puentes to travel around Spain, no trip was in the cards this time around. Most people have fled to the South to hit the beach, and while I certainly would not complain if I were sunbathing in Málaga or Alicante right now, I have to say, some relaxation and me-time is quite welcomed. I’ve got a great to-do list, nicely balanced between springtime frivolity and productive monotony, and progress has been made. Plus, I used the word thrice.